The fantasy football waiver wire can often make or break your season. Making the right decision on which players to add and drop is crucial, so we have you set up with a deep list of potential waiver wire adds for Week 11. Mitchell Trubisky, CHI (15-30%) — He’s the No. 7 fantasy quarterback and is somehow available in 25% of leagues. Dak Prescott, DAL (10-20%) — Since Week 6, Prescott ranks eighth among quarterbacks in fantasy scoring. His arrow is pointing up with the Cowboys offense improving. Rashaad Penny, SEA (20-40%) — It only took 10 weeks, but Penny finally showed flashes of why he was selected in the first round of April’s draft. He may not be the clear lead back going forward, but his high ceiling is worth a roster spot for the stretch run. Duke Johnson Jr., CLV (15-30%) — Johnson got in the end zone again last week and looks to have an expanded role under the Browns’ interim coaching regime. Josh Reynolds, LAR (25-50%) — Cooper Kupp‘s season-ending injury opens the door for Reynolds to play a full-time role. He’s this week’s top pickup. Anthony Miller, CHI (20-40%) — The rookie is heating up and coming off a breakout performance in Week 10. Marquez Valdes-Scantling, GB (20-40%) — Last week wasn’t as big as we hoped, but Valdes-Scantling did manage to equal Davante Adams in targets. Austin Hooper, ATL (20-40%) — Hooper racked up 10 catches on 11 targets in Week 10. 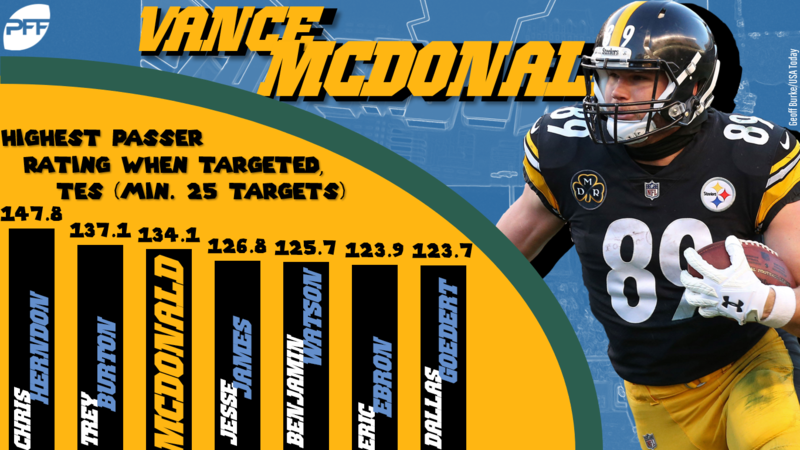 Vance McDonald, PIT (10-20%) — McDonald is far from a consistent option, but he has continually flashed upside this season. Marcus Mariota, TEN (5-10%) — Mariota has looked like a completely different player over the last two weeks. He’s an intriguing upside option for the stretch run. Lamar Jackson, BAL (5-10%) — With Joe Flacco‘s status up in the air, Jackson is worth a speculative add. His ability as a runner means major fantasy potential if he draws the start. Derrick Henry, TEN (10-20%) — While Henry is clearly behind Dion Lewis in the pecking order, his role in the red zone is favorable for fantasy purposes. Theo Riddick, DET (5-10%) — With Golden Tate out of the mix, Riddick continues to be heavily involved in the passing game. Spencer Ware, KC (5-10%) — Ware’s role is somewhat minor right now, but his value would skyrocket if something happened to Kareem Hunt. Malcolm Brown, LAR (5-10%) — He’s arguably the league’s top handcuff. Brown could also have value at the end of the season if the Rams decide to sit their starters. Josh Adams, PHI (5-10%) — Adams has clearly been the Eagles best early-down runner and is going to see an expanded role going forward. Doug Martin, OAK (5-10%) — There isn’t much to like about the Raiders offense, but Martin is running hard and is still somewhat widely available. Rod Smith, DAL (3-5%) — It’s handcuff season, so Smith is worth a stash as the next man up in Dallas if Ezekiel Elliott got hurt. Elijah McGuire, NYJ (3-5%) — The Jets offense was a disaster this past week, but McGuire has shown some upside and has out-snapped Isaiah Crowell in each of the last two weeks. Danny Amendola, MIA (10-20%) — Amendola is coming off an 11-target game and he should see plenty of work this week with DeVante Parker banged up. 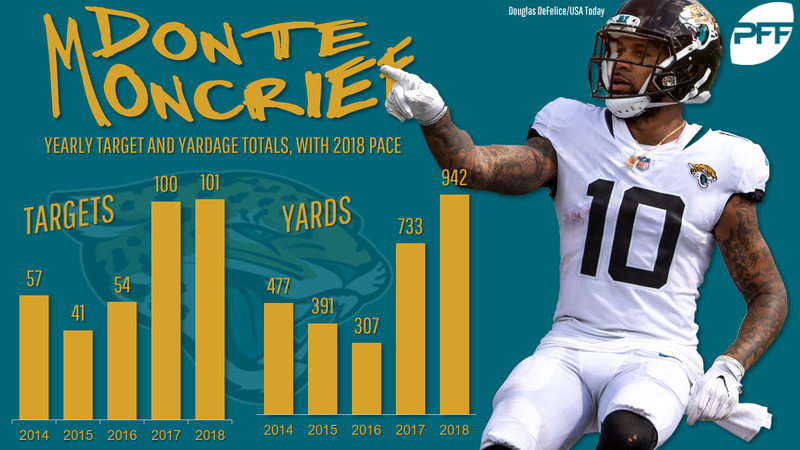 Donte Moncrief, JAX (5-10%) — Moncrief flashed major upside against his old team and figures to be a factor for the Jags down the stretch. Dede Westbrook, JAX (5-10%) — He racked up nine targets last week and should continue to see volume down the stretch. Zay Jones, BUF (5-10%) — The Bills offense finally looked competent this past week, and Jones led the charge. John Ross, CIN (5-10%) — With A.J. Green sidelined, Ross saw eight targets and caught a touchdown. Josh Doctson, WAS (5-10%) — Doctson got in the end zone last week and will continue to be a red-zone asset for the Redskins. Jonnu Smith, TEN (3-5%) — With the Titans offense surging, Smith deserves consideration if you’re hard up at tight end. Josh Rosen, ARZ (1%) — Rosen is in play as a deep league streamer this week against a shaky Oakland secondary that allowed a breakout game to Nick Mullens just two weeks ago. Jacquizz Rodgers, TB (1%) — Don’t expect Rodgers to post another 100-yard game any time soon, but do expect him to continue to be involved in the passing game going forward. Jaylen Samuels, PIT (1%) — With James Conner banged up and Le’Veon Bell nowhere in sight, Samuels is a sneaky add in deeper leagues. Maurice Harris, WAS (1-3%) — Harris came back to earth after his breakout Week 9 performance, but he’ll still be a part of Washington’s plans with Paul Richardson on injured reserve. Robert Foster, BUF (1%) — Those in deeper leagues may want to take a look at Foster after the first-year wideout out of Alabama topped 100 yards on three catches in Week 10. Ricky Seals-Jones, ARZ (1%) — The second-year man saw nine targets last week, catching 5 for 51 yards. Arizona Cardinals, ARZ (1%) — The Cardinals are this week’s top DST add with an extremely favorable matchup on tap against the Raiders. Over the last two weeks, Oakland has surrendered a whopping 12 sacks. Carolina Panthers, CAR (1%) — Carolina is available in nearly half of leagues and gets to face a Lions team that has allowed 19 sacks and 7 turnovers over their last three games.